On April 14, 1948, one of Jerusalem’s finest old houses became the site of an assault by Jordanian Legionnaires. After a fight in which 35 Jews died, all that remained of the house was a stone gate and three walls with arched windows. For the next nineteen years, until Israelis obliterated the site in 1967, Mandelbaum Gate served as the grim symbol of a divided city and, by extension, the desperate conflict in the Middle East. In the mid-1950s, Kai Bird passed through the Gate daily on his way to school. The son of a US Foreign Service officer posted to Jerusalem, Bird understand even as a child the intractability of the struggle between two peoples who had once lived together with a degree of civilly. From 1956 until 1978, Bird went on to live in several Middle Eastern countries, each of which added a layer of complexity and sympathy to his perspectives. He later married the only daughter of Holocaust survivors, which stirred other loyalties. Most of his life was spent trying to reconcile ideas of identity, belonging, and nationhood. What makes Crossing Mandelbaum Gate a compelling and readable book is that Bird draws on what he observed as a child to add heart to complex political events. And, using his skills as a Pulitzer Prize-winning journalist and historian, he offers an informed retrospective glance at incidents he experienced firsthand. This work is truly important. In fact, it’s required reading for anyone wanting to understand how we got where we now are: how the rise and fall of secular Arab nationalism opened the door to the Islamist movement and how a misguided policy that led to short-term gains resulted in long-term tragedy for so many. 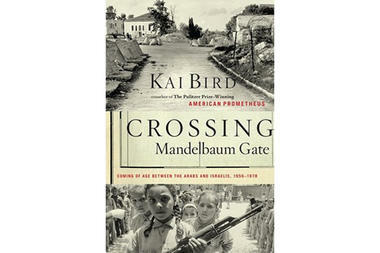 Crossing Mandelbaum Gate, Kai Bird, Simon and Schuster Australia. Review first published in the Courier-Mail in September 2010.